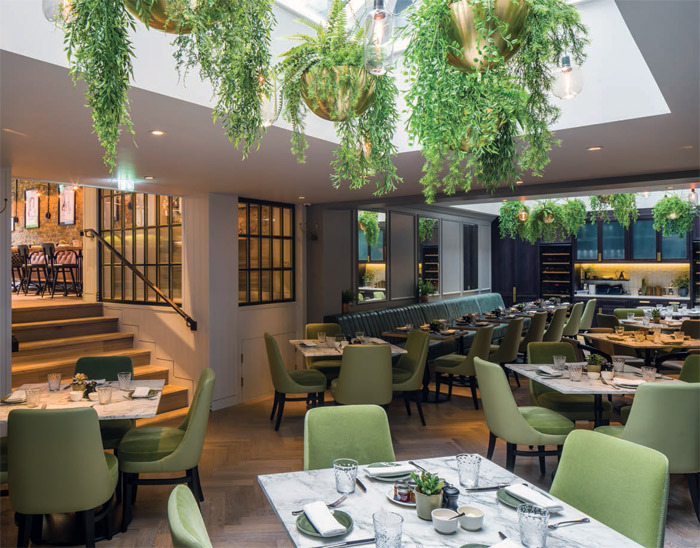 Hans Bar & Grill in Chelsea’s Pavilion Road features a contemporary interiors scheme by leading hospitality and F&B design practice Goddard Littlefair. 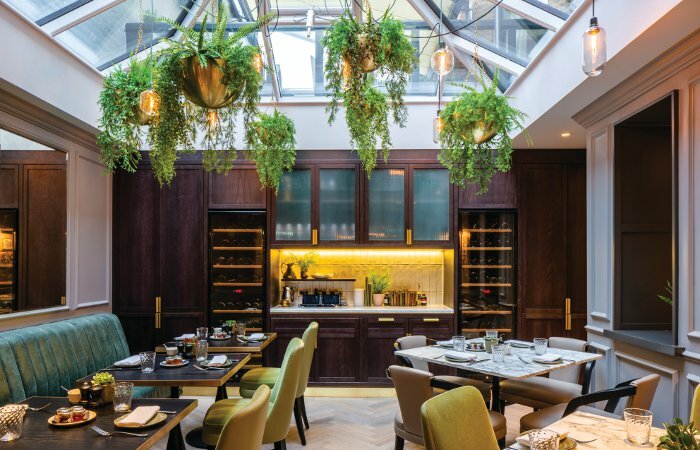 The new venue offers a new extended cafe-bar space and restaurant, including a newly covered former courtyard space, within the 11 Cadogan Gardens hotel, catering for a wide range of day-to-night guests. The new 106-cover restaurant encompasses 18 covers within the cafe-bar area, directly inside the Pavilion Road entrance, as well 46 covers in a covered courtyard area, forming part of the main restaurant, plus a further 42 covers in the dining area of the main hotel building. A further private dining space, the Curio, can seat a further 16 guests is located directly opposite the internal restaurant entrance. The cafe-bar space is located within a converted former mews garage on Pavilion Road, where it sits alongside other converted garages on both sides to form a new suite of upmarket, independent boutique retail, from barbers and cheesemongers to specialist purveyors of wine and bread. Architecture work on this, as well as the courtyard refurbishment, were carried out by ReardonSmith Architects. The Pavilion Road entrance features glazing to either side and a black-painted timber surround. Goddard Littlefair created all signage for the venue, applying new branding, which was designed by Doodle, including fascia and projecting signs, as well as way finding, menu A-boards and external menu boxes. Further graphic elements, such as takeaway bags and cups for daytime coffee and ‘grab’n’go’ orders, are also by Doodle. The bright cafe-bar space has a clean and contemporary feel with a monochrome palette, along with interesting, textured finishes, such as white, slatted-timber walls and an original, exposed, yellow-stock brick wall, as well as white tiling behind the bar, where vertically stackbonded tiles from Solus Ceramics create a handcrafted feel. The bespoke feature bar front is in split-faced stone from Stone Republic, with a natural, honed, grey basalt bar top from Natural Stone Projects providing a clean contrast. The furniture in this area is in butchers-block oak and includes bespoke banquettes with seat pads in pre-aged tan leather, designed by Goddard Littlefair and manufactured by Craftwood, located along the left-hand, exposed-brick wall. Hints of brass in this area – used within the bespoke glass screens – link the space to the restaurant beyond, where brass is much more predominant, proportionally inverting this initial relationship of brass and black-finish metal. Further striking design features, in addition to the bar, include full-height glass and metal screens in black steel and brass, which are situated to either side of the steps leading down to the former courtyard area. The ceiling is exposed and painted light grey, with architectural lighting on tracks, while feature lighting includes five brass wall lights with an industrial feel from Istanbul-based Topos Workshop, and 7 Nordlux Strap Pendant lights hanging over the bar on leather straps. Flooring directly surrounding the bar is in a patterned ceramic tile from Royal Mosa in a bespoke mix of four complementary tones, ranging from cream through to chocolate, while flooring up the left of the space, on the stairs and in the former courtyard area is a cobble grey FSC-certified brushed oak from the Solid Wood Flooring Company. The first, courtyard, section of the restaurant is filled with natural light, thanks to two major feature roof lights, from which green and black blown-glass Amp pendants by Holloways of Ludlow hang, interspersed with bespoke spun-brass bowls full of natural planting. This subtle nature theme extends into the main restaurant area and cafe bar, where small pots feature throughout on the waiter stations and along the back bar. The restaurant has a contemporary classic feel overall, with traditional wood panelling to the walls, alternating with antiqued bevelled glass panels, plus skirting and a dado rail in a light grey paint finish, as well as restored fireplaces, linking it in feel to the overall hotel, also revamped by Goddard Littlefair. The space features darkgreen banquettes with a fluted leather finish, while the loose furniture, all bespoke-made for the project, is either in grey leather or a mix of mohair and leather in a light green and dusky orange, with dark timber frames. 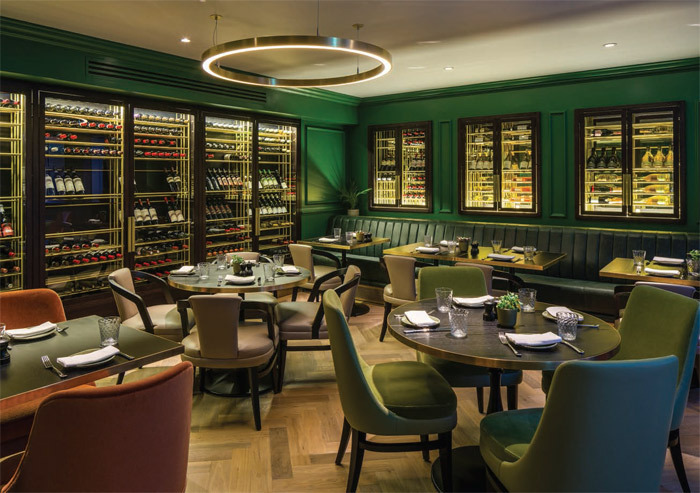 Joinery, including waiter stations and ambient wine displays, is in smoked, charcoal-stained oak and is darker toned than the grey painted walls to create contrast. Restaurant tables feature smoked charcoal timber tops, while those in the central section beneath the skylights have white Carrera marble tops to reflect the light. Approximately half of the restaurant space beyond the courtyard is an area that can be separated off for private hire. The space has 22 covers and features an illuminated wall display of 300 wine bottles. 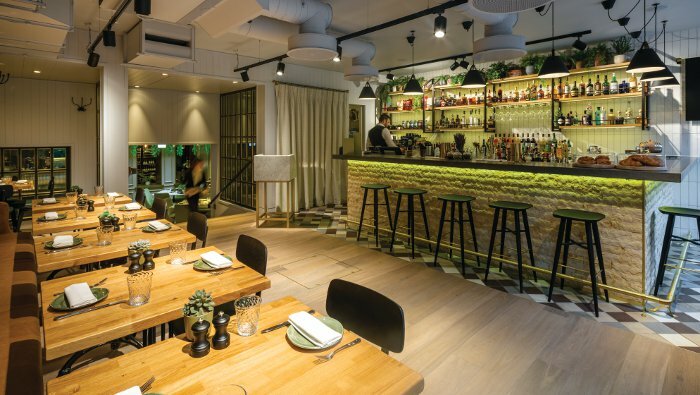 This area is in a moodier dark green palette than the rest of the restaurant, designed to set off the display, and includes green walls, green fireplace and green banquette chairs, with a pop of orange for contrast in the form of a number of dark orange upholstered mohair and leather chairs. Outside of the main restaurant and directly opposite is the 16-cover Curio space, with another space alongside, The Curio Lounge, which can be used for breakfast overspill or for more seating.